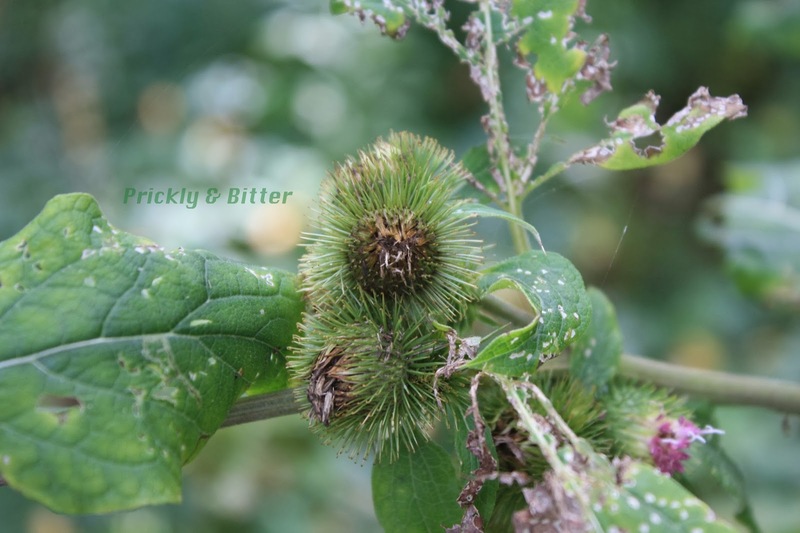 Prickly and Bitter: Burr it's cold! I decided to start this year off with a bang, or a burr if you will, using a blog post with lots of pretty pictures. :) Who doesn't love pretty pictures?! The burdock plant is pretty well-known in North America where it was introduced from Europe, the Middle East and Asia (pretty much every area in the Northern Hemisphere EXCEPT North America). Across its native and introduced range it has the potential to become quite invasive, as it thrives in disturbed, nitrogen-rich soils. 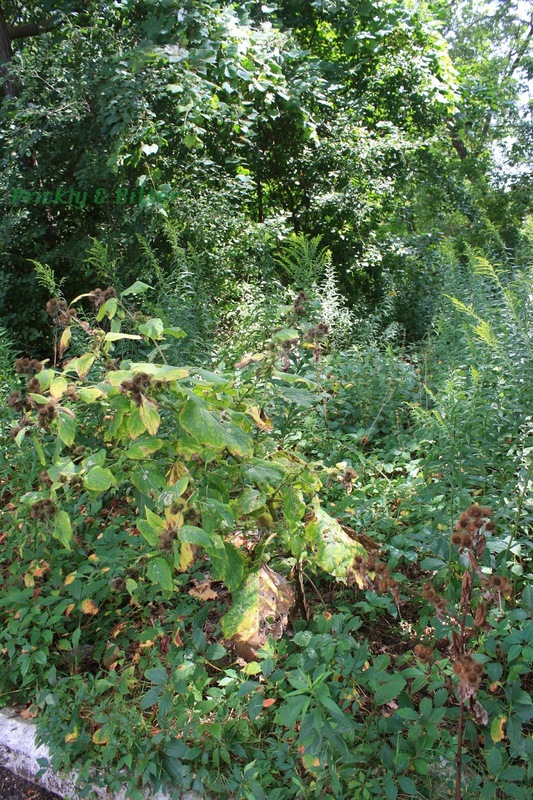 This makes it an especially-potent agricultural weed species. 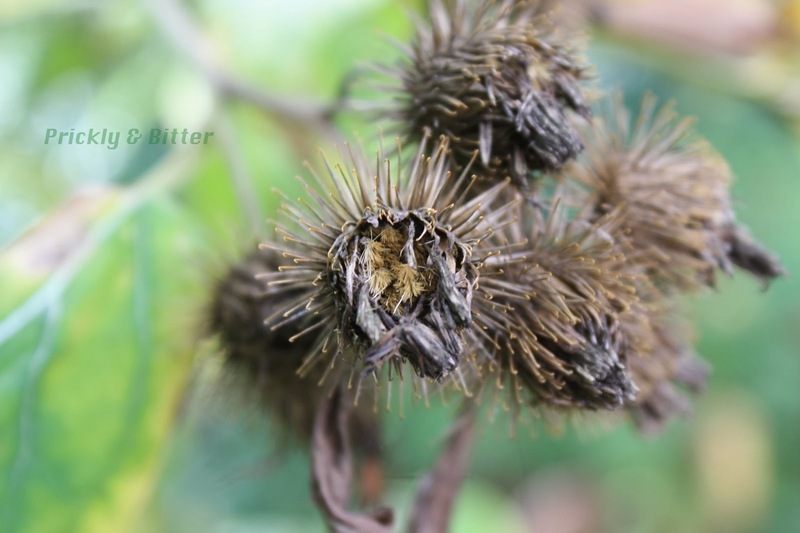 In most cases, however, when burdock seeds enter an area (especially a landscaped garden like you'd find around a home) a couple might develop into plants but spreading is rare. While I took these pictures on campus, there is also a very small colony (two plants) growing in my back yard. Since they're out of the way, I've left them there and hoped that the "keeper of the garden" (aka my dad) doesn't find them ugly enough to remove. To me, they're pretty in their own way. I wouldn't want lots of them (since they're irritating in their own way, too! ), but one or two is just fine. 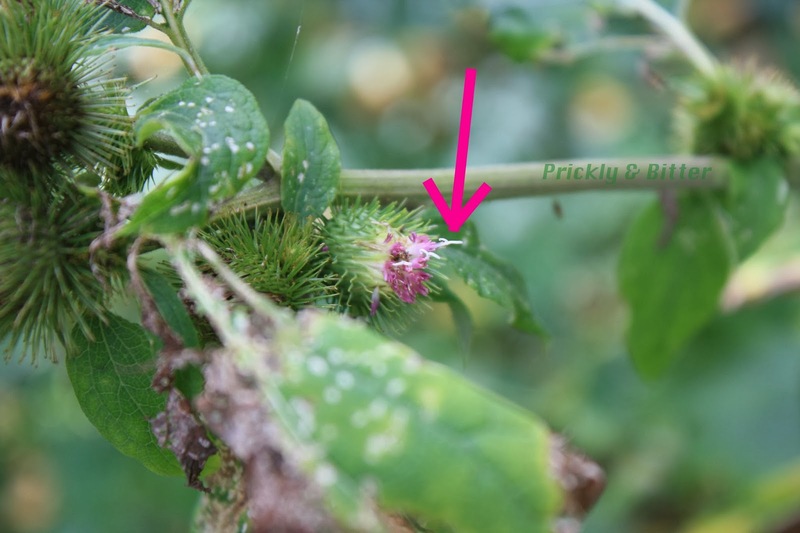 I had a bit of trouble getting this plant down to the species level because I neglected to make notes of (or take pictures of) the distinguishing characteristics between the greater burdock and the lesser burdock. One of the main ways to tell them apart is by looking at the base of the flower, or what we would call the "burr." If the flower is on a stalk, it's the greater burdock, and if the flower is directly attached to the branch (or is on a very short stalk), it's the lesser burdock. 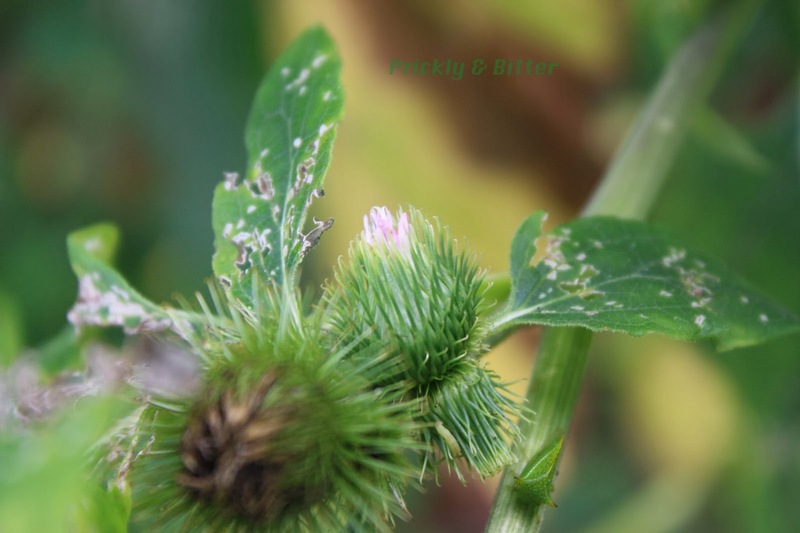 Since I think these pictures are just great, I'm going to go with the greater burdock :) Next time since I know what I'm looking for I'll make sure I photograph the stalks (or lack thereof) that the flowers are sitting on so I can make sure my identification is correct! There is one more burdock species in Ontario (also a non-native species) called the woolly burdock, but this one is easily distinguished from the other two. It has a bract at the bottom of each leaf that has very fine spike-like hairs on it. Neither of the other two species we have here show this characteristic. Aside from the flowers on (or not on) stalks, the other way to tell the lesser and greater burdock apart is based on size; the greater burdock is almost twice the size at maturity, and can have a taproot up to three feet long. For a plant that's only about three times bigger than that (but many in Canada don't reach that size), that's an enormous root! For all three species there are separate male and female flowers within the flower head. You can tell the difference by looking for the stigmas (the female bits of the flowers); they are pointed out with the bright pink arrow in the picture third from the bottom. Usually the stigmas only develop after the stamens of the male flowers have released their pollen; this way the plant can make sure the stigmas will catch pollen, but it won't be its own pollen; this is one of the mechanisms most often used to ensure cross-pollination between individual plants, rather than the pollen of an inflorescence landing on the stigma from that same inflorescence. 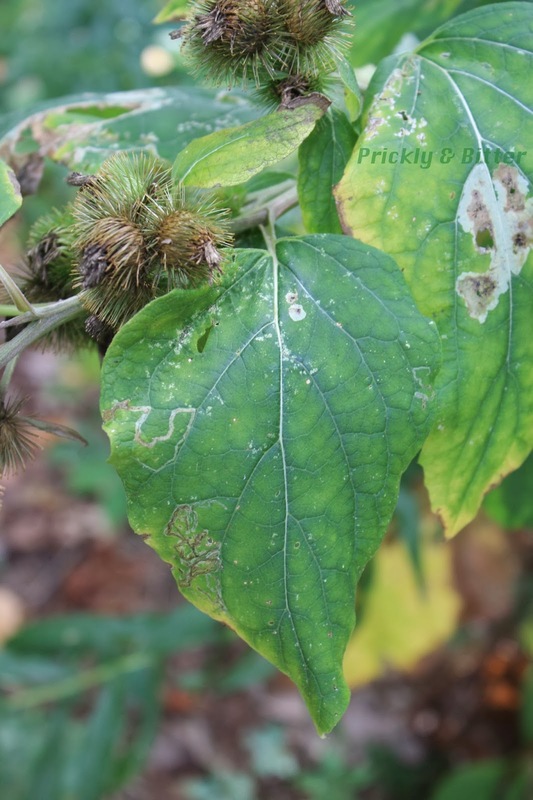 The burdock plant is pretty awesome for two reasons. First, if you look closely at the last picture you'll see that the burrs open up at the top to release the seeds, which are like miniature dandelion seeds, fluffy bit and all. The actual burr is covered in hairs with a hook at the end, and the tip of the hook has a very sharp point. This makes the burr feel "sticky" when you put it on your skin or when you grab at one, even though there's actually no sticky substance on the hairs. If you own a dog and have ever walked it through a forest or a field, I'm sure you're well aware of the nightmare that is "de-burring" a dog. The type of hair that covers dogs is just made for burrs using those hooked hairs to latch on for seed dispersal. Eventually, the dog will roll around on the ground, breaking open the burr and releasing the seeds (or the seeds will just gradually fall out of the hole in the burr, being released as the dog walks). Burrs certainly didn't co-evolve with dogs, but more like woolly mammoths, bears, moose, and other animals characteristic of northern climates (dogs just happen to be what is most likely to come by now). In the 1940s, a very smart man by the name of George de Mestral was getting very annoyed at having to pick burrs off of his dog after taking him for walks. After a few years of this he decided to clip some out of the dog fur instead of pulling them off so he could look at how the burrs attach to the dog hair. He realized he could exploit this technology; by collecting his dog's hair that comes off in brushes and the hairs of the burr, he could glue one to one side of two things he wanted to join, and glue the other to the other side. Once they come in contact, they would be permanently joined until they were carefully separated. Obviously no one wants dog hair and burrdock burrs glued to their clothing, but making synthetic versions of both of these gave us one of the most important inventions in the 20th century: velcro. Parents will small children: Mr. de Mestral I'm sure says "you're welcome!" The other awesome part about this plant is that the giant taproot forming at the base of the plant is actually edible. Back in the Middle Ages in Europe this plant was actually one of many staple food crops, and was eaten and cultivated across Europe. Since then it has largely been abandoned as a source of food, but every so often you find it popping up in local cuisine. In Japan, for example, greater burdock roots are still peeled and cooked in a traditional stir-fry dish called kinpira gobo ("kinpira" for carrot, "gobo" for burdock). I didn't realize what I was eating at the time, but I had this dish when I was in Japan. It's pretty good! Not all that much flavour, but certainly not undesirable. I would definitely have it again now that I know what I'm eating. Greater burdock roots also have a long history of being used in Traditional Chinese Medicine to treat blood and kidney diseases. Depending on what part of the plant is consumed (not the roots), it can be a pretty powerful diuretic, so if you don't know what you're doing, don't cook it. Other medicinal uses have not been established to be effective or ineffective, but there is some anecdotal evidence to suggest that some uses may be beneficial. First, the Ojibwa people have used burdock roots in a tea-like preparation to treat cancer (no evidence this is effective) and the leaves in a maceration with oils to treat baldness (also no evidence this is effective, but it does clean hair nicely if rinsed well). The Chinese also crush the seeds and consume the powder to treat flu, nausea and colds, and there is some evidence that this might be effective. The seeds contain chemicals called arctigenin, arctiin and aglycone, which have been shown in mice to be effective as: anti-viral treatments (especially against influenza A), anti-inflammatory agents (especially in the small intestine, but also to some degree in swollen joints as a result of arthritis), and anti-cancer treatments (extracts from the seeds, and pulverized seeds themselves, have been shown to kill tumour cells growing on artificial nutrient medium in petri dishes; this has never been tested in a living body of any type of animal). 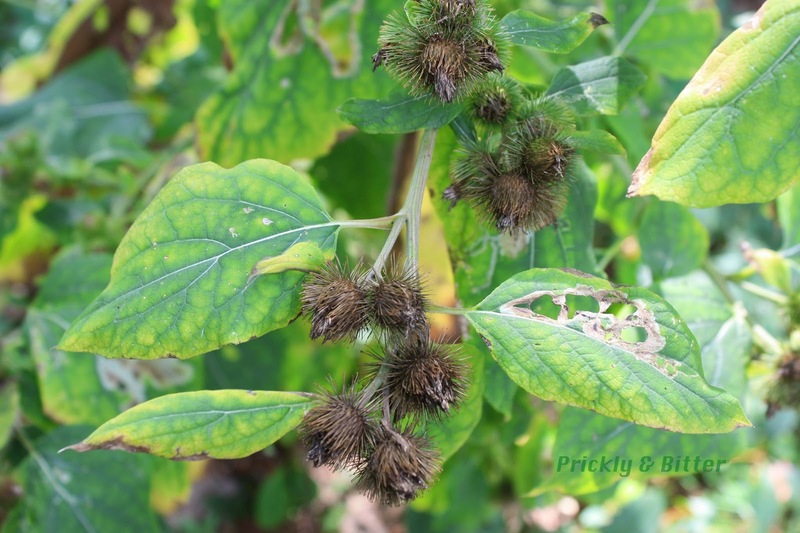 You never know; in a few decades burdock extract might be one of our new "wonder drugs"! I'm back at blogging, and thanks for sticking through my absence! I really appreciate all of your continued support in my endeavours to spread the word that plants are awesome. Happy New Year to those that celebrate at this time of year!